My Little Pony: What’s in a Name? In the recent Bronies React review of the My Little Pony Season 5 premier, one of the bronies went on about how a pony’s personality seems to be tied to their cutie mark. For example, when Pinkie Pie has her cutie mark taken away, she stops being funny and energetic. But wait a minute, let’s analyze this a step further. As we heard Applejack say in “Bloom and Gloom”, a cutie mark reflects what’s inside you. So can what’s inside you be taken away as well? But then that begs the question, how did what’s inside you get inside you? A cutie mark may show what you are meant to do, but, perhaps, the real question is how much power does the name given you have? Think about it. AJ’s parents named their first two kids Macintosh and Apple Jack – and they end up with apples on their plots. And we’re all expecting the same for Apple Bloom. Two other ponies named their daughter Fluttershy. She flutters (as opposed to high-speed flying like Rainbow Dash) and is shy. Rainbow Dash dashes around in the sky. Rarity has gems on her plot, which are rare and beautiful, which segways into fashion. So do cutie marks really show their destiny, or was their destiny set by what their parents named them? And if that is the case, are pony parents aware of what they are doing? Do they set their foals destiny on purpose? Did AJ’s parents (when they we still around) name their three kids Macintosh, Apple Jack and Apple Bloom so they would always stay on the farm to run it? Did the Cakes name their kids Pound Cake and Pumpkin Cake so some day they would take over Sugar Cube Corner? Did Fluttershy’s parents want her to be shy? Why would they want that? Which makes you wonder, what were some parents thinking? Snips and Snails? Did Snips’ parents want…what, a barber in the family? And Snails…did his parents want him to be slow? Did Filthy Rich name his daughter Diamond Tiara so she would be a snooty prima donna? 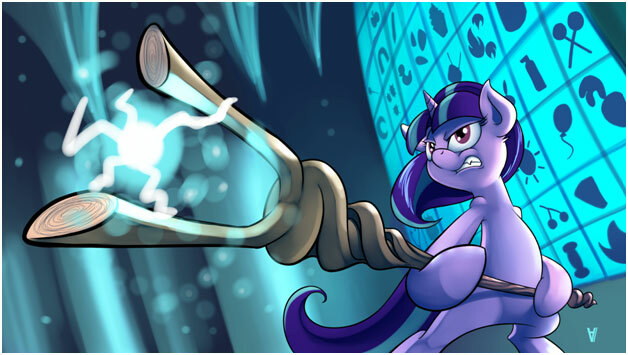 Was Trixie destined to a life of low-level magic that would amount to no more than some parlor tricks? No wonder she doesn’t like Twilight. She must be as jealous as Tartarus. And if this line of thinking is correct, aren’t you just asking for trouble if you name your twin sons Flim and Flam? And then there’s Twilight Sparkle, Sunset Shimmer and Starlight Glimmer. Is there something inherently magical about a “sparkly” name? Can you give you foal a name like this if they are not a unicorn? Or will the name police come down from Canterlot and arrest you while you’re filling out the birth certificate? Is this all some cultural phenomena that nopony is even aware of, or is it a deep, dark secret that no pony speaks of? I don’t have the answer. But if I were a pony living in Equestria, I’d stay away from any pony named Kill Joy, Buzz Kill, World Wrecker or Sun Snuffer.